Arabs took advantage of the Sabbath to set fire to a container belonging to the evicted residents of Beit Hamachpela in Hevron. Arabs set fire, during the Sabbath, to a container belonging to the evicted residents of Beit Hamachpela in Hevron. The container contained furniture, supplies and holy books. 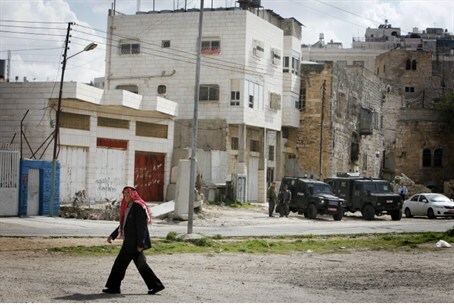 The residents of the Hevron home were evicted by order of Defense Minister Ehud Barak on April 4. The 15 families who were evicted from the home bought it from an Arab and had moved in after the sale, fearing the building – uninhabited – would be occupied by local Arabs before the Civil Administration validated their purchase. By evicting them several days after they moved in to the home, Barak violated an agreement made with Prime Minister Binyamin Netanyahu and other senior ministers to delay action on the issue until several weeks later. Meanwhile, the Palestinian Authority has been threatening to execute the Arab who sold the Hevron home because of a PA law which stipulates that a person who sells property to Jews will be put to death. Since the eviction, the residents have been living in a tent which they erected in a parking lot near the Cave of the Patriarchs and which is constantly manned, 24 hours a day, seven days a week. Shlomo Levinger, a resident of Beit Hamachpela, told Arutz Sheva on Sunday that the residents’ belongings are inside a container which was placed near their encampment. He said that on Shabbat afternoon, as the residents left the tent for afternoon prayers, the container was torched. “We left for only five minutes and when we came back we saw the container on fire,” he said. “A police car which was on the scene called an Arab fire truck, which arrived very late and took its time putting out the fire,” he added, hinting that the Arab firefighters deliberately dragged their feet and took their time extinguishing the flames. Levinger said the vandalism and property theft by local Arabs is ongoing, noting that this time they were especially daring and torched the container in broad daylight at a point located about fifty meters from a Border Police station. Asked about what is happening in the legal arena in terms of the residents’ returning to the home, Levinger noted that on the day the residents were evicted, Netanyahu said he hoped that within one month of the inspection of the documents of sale, they will be able to return to the home. “Four months have passed since then and we're still not allowed back in,” he said. He added that last month, the authorities asked the residents to produce documents that clarify two points that were in question. The documents were produced, he noted, but nothing happened. “I'm sure that if the area in question was not in Judea and Samaria we would have been inside the home long ago. The problem is with the official who has to approve the transaction in the Land Registry. He refuses to do so,” said Levinger, noting that when he says ‘official’ he means Barak.